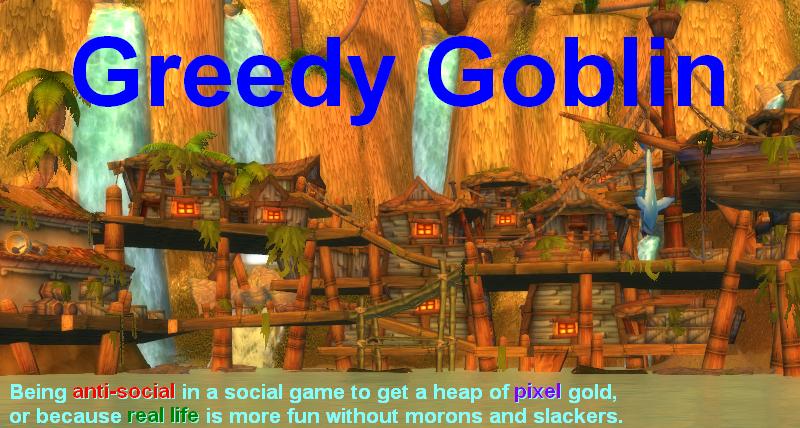 Greedy goblin: Why do we play? Tobold has a series about why do we play. I didn't really like his conclusions but I couldn't disprove him until now, when he wrote about playing for rewards, claiming "rewards are one of the strongest reasons of why we play". This is 100% wrong. No one plays for (ingame) rewards. It sounds weird, considering the unquestionable truth in "Give out epics for PvP, and suddenly a lot of people who never liked PvP before will start to do it." "Why do we play? ", meaning why do we buy and play WoW instead of watching a movie or meeting with real life friends or reading a book, or climbing mountains. "Why do we play that way?" meaning why do we go to Isle of Conquest instead of Shadow Labyrinth? - Sir/Madam/Hi, would you try out Blizzard's best seller game World of Warcraft? - What could this game offer me? - Lot of epics. All you have to do is grinding some random wolves for about 100 hours and after that you can get epics easily by AoE-ing 5-man dungeons. - So if I buy your game, I have to repetitively kill easy monsters for about 100 hours? - Well, we have "invite a friend" program to skip that. You can get to max level in 40 hours! - So I'm there at max level in like 40 hours and there I get? - As I've said lot of epics. - Items of epic quality. - What are they good for? - They give your character lot of stats. At max level that's the only way to progress your character. You can even reach 40000 HP with proper epics! - Which is good because? - Because you can be a good raid tank. - You can defeat harder content, getting even better epics! It sounds like a Monthy Python sketch to me, rather than successful marketing. Ingame rewards, by being "ingame" are useless to anyone "out of the game", so no one can decide to play/continue to play the game to get these (non-existent) things. People can decide to start/keep playing for out of game reasons (unless they are insane believing that the game world is real). I do not question the fact that developers can trick people into playing "wrong way", repeating the same content again and again, paying a lot to the company for the same content. However the reason of playing is always out of the game. Challenge. The player wants to do something hard and overcome it. Only by doing challenging task can a person reach the state of flow. Tobold is absolutely right that the developers can create a game that is not challenging, still looks as one. This is very good trick to keep unskilled and unmotivated people in the game. However they are still motivated by challenge! The fact that grinding wolves for 100 hours is boring for us does not mean that it doesn't prove challenge to the average gamer. Learning. The player considers the game a simulation and believes that he learns something real in the game. Chess is considered by almost all to be a game that improves logical skills. The opinions about WoW is not so good, but it doesn't matter. As long as the player believes (even if completely wrongfully) that he learns something useful ingame, he is motivated to play. Developers can create content that teach people useful skills, or they can trick the player to believe he learns something useful. Wasting time. Sad, but true. Many people simply plays because they have nothing better to do. Their alternatives are watching the wall, or even worse: afternoon TV talk-shows. Developers only has to create content, no regardless quality. Even a simple browser-flash whack-a-mole will do. Escapism. The player want to be immersed to something that is not his real life. The developer have to create content that let player completely focus. Now let's see the social reasons. Be advised, that since they depend on other people, developers cannot create them. However they can trick people believing that they are getting it. Playing with friends. The player is motivated to do something that his real life friends do. If they play WoW, he plays too. The game itself is a necessary evil. Developers can support these players by creating content that does not need immersion, attention or skill. Playing with "friends". The player is motivated to do something together with strangers who accept or at least don't reject him, making him believe they are his friends. Developers can trick such people by creating content that enforces group play. While the truth is that Johnny is only tolerated in the guild because without him they couldn't do Naxx, he believes that the guildmates are his friends. Without a content that requires 25 people, he would no longer be there, but of course no one tells it to Johnny. Being respected by people. The player is motivated to achieve a "high status" in the player community. The player plays the game to get items and achievements that he believes to draw other people's respect. The developers can trick the player to believe that certain items and achievements are rare status symbols, therefore having them draws respect. Obviously these items cannot be rare, or they couldn't satisfy all players. Actually the circumstances make the impression in the player that he owns something special, although everyone who cared to log in owns it (or something similar) too. This false status symbols are the "ingame rewards", and Tobold is absolutely right that these socials can be easily made to do lot of pointless and boring things to get them. Pwnage! The player wants to pwn other people, displaying and feeling superiority. Note that fair competition is not his aim, as he would lose or win only by little. He wants to feel God, usually because he is a loser in life. Developers can trick this person to play by creating content where they can attack players who can't fight back. Of course they have to be careful as ganking would turn other players away. The trick is low or 0 PvP death penalty, so the ganking victim is just lightly annoyed, while the ganker feels satisfaction. So the player plays the game for his own motivation, either real or social. The developer cannot change that. However the developer can make the player believe that he can reach his goal in the game, even if it's factually not true, or theoretically impossible. The developer can largely change the ingame player behavior by creating an illusion that a certain piece of content gives the player what he wants. It's true that developers can make lot of players do terribly boring chores just by offering rewards. However these players still dont play for rewards. They play for social respect (which they believe they will get if they have ingame rewards). The developer always have to keep in mind that while he must give these rewards to all the players, he also must create the false illusion that these rewards are somehow special. Why is it important? Because it gives us a way to fight for better games. But that's another post. This is a very long an complex answer to something that seems so simple to me. In fact I think Tobold wasn't far of (didn't click the link, going for the line). But a bit differently put. Just like in real life, people want constant improvement. People live for obtaining "better" stuff. Real life is just that, only it's a lot harder. Promotions, better jobs, bigger cars, bigger houses, ruling the world, whatever ultimate goal you can think of. I mean, people are programmed to constantly want to improve, getting higher up. Socially of course, but usually by means of the material. This IS life's all encompassing challenge. And so does wow work too.. It starts simple, with leveling, improving, expanding your character. And when you reached the top, you start improving his gear, his collection of vanity items, his trophies (achievements). There is so much that 24h a day is not enough for anyone to get it all. And to make it all complete, the social factor is included in game so you can share and compare your character growth and riches. I certainly don't intend "Why do we play?" to be limited only to the much narrower question of why we install the game for the first time. People install and try much worse game. The interesting thing is why people KEEP playing the same game for thousands of hours. Even an extremely anti-social game like WoW, which makes you hate your fellow players. By just observing what people do in the game, I'm still sticking to my point of view that rewards are the biggest motivator. Even if that isn't what people initially say, or what is printed as motivator on the box. Just wait until Blizzard adds an achievement reward for dancing naked on the mailbox, and you'll see thousands of players doing it. @Tobold: my reason is learning. I believe that I learn a lot about people in this game. This is maybe completely wrong, but as long as I believe it, I keep playing. Would anyone play for rewards in a single player game? Have you ever seen grinding activity in single player games? The "rewards" themselves motivate no one. They believe that they will be respected for having them. Just look for any "Jenkins" or "Explorer". You won't see many. These things were "hot" once, but now they are "pathetic" as everyone knew that all can do it. Lot of people grinded these titles and now they hide them as they are no longer "cool". Yes - people grind in solo player games. Not as much as those who grind in MMOs, but still quite a lot. There are whole web sites and forums about how to develop the perfect character in this or that RPG. Blizzard took the formula for MMOs (immersion, social interaction, ..) and added what they also added in Diablo: A brilliant reward structure. They realized that a game doesn't have to be fun, if it is rewarding. In fact, they realized that there is no inherent difference between "fun" and "rewarding". Just look at the Ony-is-back hype right now. I could literaly vomit over this. It rapes the lore. This doesn't have to do the slightest thing with immersion. Still - people seem to love it - because Ony-is-'cool' and if the rewards are good people will wipe there. If the rewards are bad Onys lair will be a deserted place. You're missing out a few reasons why people go for these rewards though in my opinion. Firstly there are people who like 'stuff'. The type of person who bought a small figure of a cartoon character when they were a child, but doesn't want to throw it out now, because they like keeping it and knowing they have it. People will go and buy all the 60% mounts even though you only needed one when levelling, to never get any of them out again. Admittedly they are probably working toward a dragonhawk, but they still would want as many as possible. Plain and simply they like 'stuff'; virtual or real, if they can see they have it, they like it. Also, going after achievements and other in game rewards gives you something to do. Blizzard have made a game where there is ALWAYS something to do, and have given easy to see goals. One of the many reasons why people get addicted. I mean look at you Gevlon, you don't go after achievements, but you collect gold. You don't need this gold (like in my first point) because you have so much, but you like having it and collecting it gives you something to do. I am trying on my main save on Fallout 3 to get all my characters skills to 100. Not because I'm going to show all my friends, but because it will give me a sense of accomplishment in the long run, but also something to do for now; it is that save's goal. Another example of people grinding for rewards is the recent phenomenon of grinding heroics for emblems. Most people have seen the content dozens of times and are not challenged by the content. But still they enter the same heroics every day to get ilvl 226 items. As I write this down, I am thinking about why I do it myself too. Why do I want those epics? The answer is that I believe that higher level gear will allow me to progress further into Ulduar and Trial of the Crusader. Therefore, the reason that I grind heroics, is that it will allow me to see and beat more difficult content. @Nils: if there are web sites about it where people meet, it's no longer a single player game! There is social space on those sites so there is hope that these people will respect me if I "complete" my character. There is social space on those sites so there is hope that these people will respect me if I "complete" my character. Not necessarily. It's just hard for me to prove that somebody does this who hasn't told me or anybody else. People like to optimize things and collect things. Bragging about it is not the only reason, although it might a major one. The fact that you don't seem to understand that people do things although they don't intend to brag about it, actually baffles me a bit. FFVII. I was having fun playing this game. The materia system is very interesting and allows for some nice character customization. One day I was invited to a friends house so we could watch him play his game of it (he was furthest along out of all of us), when I noticed he and I were in the same area, except he was 10 levels higher than me. So began me telling him he is NOT furthest along, just higher level. He has me prove it, and I load up my game, and showed him we were in the same area. He looked at me like it was impossible he asked, how do you kill the monsters, and I said very easily, and I went out and killed monsters faster than he did. That night he destroyed my memory card and I've hated FFVII since. I was perfectly happy playing the game without anyone knowing that I was doing "awesome job" at it. BUT, when I showed him how much better I was doing, I felt really good. Similarly I'd play megamanX games and randomly pick a boss. I'd then go and beat him with just my blaster. Both these games get easier with leveling up or with gear, and yet just getting the gear does not make the game fun. It's what I get to use that gear for that makes it fun. Well it doesn't sound like a monty python sketch. A lot of players were brought to WoW from previous warcraft games and in my own personal experience I came to WoW to see inside the world I had previously played in. Exploration of the world was a joy. I would argue that you are both right and that we all play for a sense of accomplishment. I know I'm playing now to see if I can ever reach 100,000 gold, to level my 4th healer, to epic out my resto shaman (only 4 more pieces to go), and gear all 3 healers for the new instances. No surprise that such a confirmed neo-capitalist as yourself can conceive of no reward that isn't loot. But for what it's worth, there are more rewards to a game like WoW than gear. No, really... But at the end of the day, I think the argument is semantic. The achievement of meeting and beating a challenge *is* a reward, as much as the epic drop or the badge. You and Tobold are in agreement, you just disagree about what constitutes a reward. Gevlon. Although I usually agree with your analysis and you aren't that far off I don't think rewards always go hand in hand with bragging rights. Why do we play is simple. We start playing a game because it's fun...but we continue to play the game as long as there is akways some sort of progression. Once you can no longer progress in the game you will stop playing, so Tobold is basically correct. In terms of WoW we all started playing because it is a fun game, and we continue to play because the only way to progress is items. For a lot of people, I expect, (It's this way for me) It's about challenge and the concept of 'Flow' you linked. In FFVII, even though noone could see me, I beat both Emerald and Ruby weapons, the 2 'Optional super bosses'. I had no in game reason to do that, noone saw me, and it took forever. In WoW, At first I was excited about the Conquest badges. But now I'm "So what? Why improve my characters? So it will be easier to kill Mimiron if we meet again?" No... the problem there isn't me, and I'm sick of boosting others. I guess I do agree with your analysis on the reasons that people play. I know that it is not recommended to psychoanalyze yourself, and if I tried to look at your list and say what my reasons were, they may not actually be accurate. I do remember a long time ago after I had been playing Everquest for a few months, I got angry at the game one day and told my friend I was quitting and that the game seemed like a big waste of time. He replied, "Isn't that the idea of this game?". I know that isn't the only reason to play, but I have wondered ever since then if people were deliberately trying to waste time. The fact that it was on your list of reasons to play, I think is a very honest assessment. Why would people want to deliberately waste their time? And do we really want to know the answer? It could be disturbing. But progress is a big motivator, after all how many people quit if Blizzard takes too long to relaease a new dungeon. They've already won everything (or gotten as far as their limited skills allow), so there's nothing left to accomplish. But when there's a new expansion, people flock to the game again since there's so much new stuff to do and progress towards. Also learning can be seen as in the same category of private accomplishments. Unless your real goal is to have a blog to brag to us about how much you've learned, your learning about people is a personal/private goal. In much the same way a person soloing/ single player gaming would have goals in the game that their progressing to. Their motivation is likely as much about bragging as yours is. Yaggle, before you know what the meaning of life is you will not be able to know what is not a waste of time. Educating yourself for .. what? What's the purpose of visiting your grandparents? You don't know. And if Darwin is correct there is no purpose. You just evolved and you behave in a way that somehow maximizes your short mid and long term fun. I didn't think this was such an issue. It's always seemed obvious to me that people who play for loot simply don't realize what they're really playing for. I play the game for a number of reasons. I enjoy the feeling of a first boss kill. That's used to be number one. Now that work gives me a similar feeling (working with people to achieve a common gal) it's kind of slipped. I play now for the purely social reasons. I like to play with my friends and I like loot. Loot is social for me. I don't like it because it allowed me to see new content or face new challenges, I like it because I can I go to WoW-Heroes and say I'm better than you. I realize there are flaws in the way I see things, but I also try to be honest about why I play the game. Grevlon is very right when says we don't play for loot. Loot is simply a tool by which we measure. We measure our ability to meet a challenge, we measure our superiority over others, we measure how much we're liked and taken to raids. The goblin and his gold is another good example. None of us think he plays to make gold, but his gold (and now the gold that he teaches others to make) are a bit of a measure of something I'm sure he enjoys in the game. Whether it's learning economics, teaching it to others, or simply a feeling of not being M&S only he can say, but we can all say for sure that the pixilated numbers next to the little coin are not the motivating factor in his continuing to play. I don't know how the majority of people perceive the significance of their achievements or grinding, but I know for myself that I play to observe the progression of my characters. I got involved in WOW when I couldn't go any further with Oblivion. In Oblivion along with advancing the linear progression of my characters, I would collect armor sets and other ridiculous knick-knacks, because I felt they were a part of a story I was telling myself about what I was doing with my characters and what their place was in this virtual world. In a lot of ways I play WOW as if it were a single player game and am annoyed when I have to work with other people to achieve some goal I've set myself up to complete for the sake of my entertainment. If I achieve some title it never occurs to me that it might impress someone in game, I find satisfaction in having achieved something that I feel is relevant to my character. I guess I'm like an RP'er that mostly talks to himself through his role-playing. I think there is an unheard majority in WOW that is so uneducated about what progression in the game entails that it's difficult to imagine them doing anything for the sake of jockeying upwards in some social hierarchy based on in-game rewards. I think a lot of what you might term M & S are the way that they are precisely because they utterly lack an awareness of other people in the game. I'm not much of an athlete but I've run a couple of marathons and completed 3 triathlons. The training required for each race was many months. Not really fun. The races were not really fun, either. More like a "grind". I now consider myself a lifelong runner. There is that health benefit, but it's certainly not what you would consider "fun". But I still do it and have hardly gone a week without doing it for 15 years. You could say I love it, God knows why. I started playing WoW 18 months ago and I could say many of the same things about it. I'm driven to do it regularly, sometimes it's a solo grind, sometimes it's a race with a group, advice from others is helpful, and I'm proud of some of the achievements. AND I like talking and reading about it. Unfortunately, no health benefits. Why do we play? Because it's an interesting distraction and humans as a whole are driven to get better at something little by little. Some like to brag about it, some don't, but we all like to get BETTER. There's also a bit of crossover. On our EQ server there was a guild that was well ahead of anyone and everyone else for a long time. Guild drama eventually led to its breakup, but until then they killed everything first (sometimes months before anyone else did) and did it with greater efficiency. It's clear that the challenge drove them to play. The guild leader tried WoW beta and decided that the game was not for him. He felt that the content was too accessible and that it did not allow him to separate himself from the average player, to stand out enough that he could be recognized. So his reasons to play were twofold- he sought a challenge that would be difficult enough to make him stand out as an exceptional player. I really do enjoy your posts. The analysis is quite good, even if one doesn't agree with your conclusions. I have recently been thinking about what I want out of this game, the compulsion that I, and most others I know who play, feel, that motivates us to play more than we would like to, or should. For instance, and this is interesting because you don't directly cover it, and it is tangential to the main game, but I am one of the major netherweave bag players on my realm. I sell 20-30 bags a day now. I have plenty of gold, since I only spend it for raid consumables. Yet I feel compelled to log in every morning, grab as much cloth as I can, check who is selling and at what price, and then pick the strategy for the day. I feel almost like I own this market and need to defend it, even though I have 2 frostweave bags full of bolts and thread, and can undercut anybody anytime and still make a profit. My goal is to minimize my play time while maximizing my in-game productivity. Yet I frequently find myself chasing after things I don't need or that don't matter(like the kaluak fishing pole). One of the reasons I didn't want to play this game is that my personal videogame demeanor has always been, "Play the $%#@$% out of the game until you kill the final boss, then put it down forever." I didn't want to play this game because it never ends. If I was to down the final boss, and had all the best gear, I am not sure why or whether I would keep playing. I have been reading your blog for months. All I have to say is: you're dumb! You are the worst waste of space on this insignificant place we call Earth. You turn a waste of time (WoW) into something that classify people as Morons and Slackers and smart people. It is a PC game that means nothing. NOTHING in the real world. You are nothing. Gold capped in a MMO? what has this taught you in real life? you are wasting talent. but it provides an in depth analysis of why people play online games.